committed to the call of the Gospel. 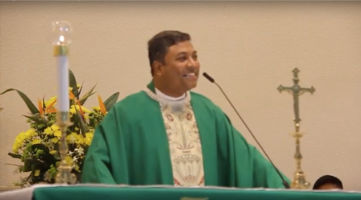 Click here to watch the sermons delivered by Fr. Joseph Royan from 12 - 20 September 2018. We also invite you to spend time with the reflection questions for each day of the novena. The SVDP Thrift Shop opens from 8:15am to noon on the 1st and 3rd Sundays of most months, except for June and December when there is only one sale per month. The Shop is closed during the Chinese New Year period. The objectives of the Thrift Shop include helping to raise funds for the Church, encouraging recycling and donating items to the needy. We welcome all willing hands who can help sort, clean, package, price, display and arrange donated items on Wednesdays from about 11am to 5:30pm as well as those who can man the Thrift Shop on Sunday sale days. Jalan Kelulut - Lamppost No. 4 to 9 (Saturdays and Sundays from 7am to 9pm). There is a NO PARKING Zone along Jalan Jarak from house no.1-19. HDB car parks at Block 988 Buangkok Green (opposite Mobil petrol station). See News or the church bulletin for more. NO PARKING IN CHURCH COMPOUND. Parking permitted on roads as per weekend mass. ONLY IF YOU HAVE REGISTERED, proceed to EVENT COUNTER at FOYER after 7am mass. See the Current Events for details. Click here to watch the sermons. And spend time with the reflection questions. See the church bulletin for more. 301 Yio Chu Kang Road, Singapore 805910, Tel: 6482 0959 Fax: 6481 3019 I Nearest MRT: Yio Chu Kang. Bus Services: 70, 103, 854.